I have put my baking skills to the test and here is the outcome. Okay, okay. These may not be the most "doughnut looking" doughnuts out there, I'm the first to admit that, but let me tell you something - they taste absolutely amazing. 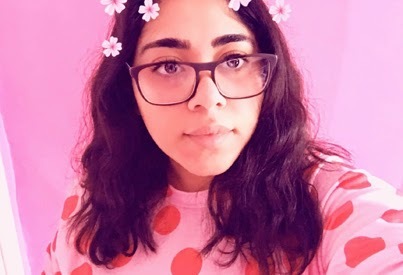 Plus look how cute they are! 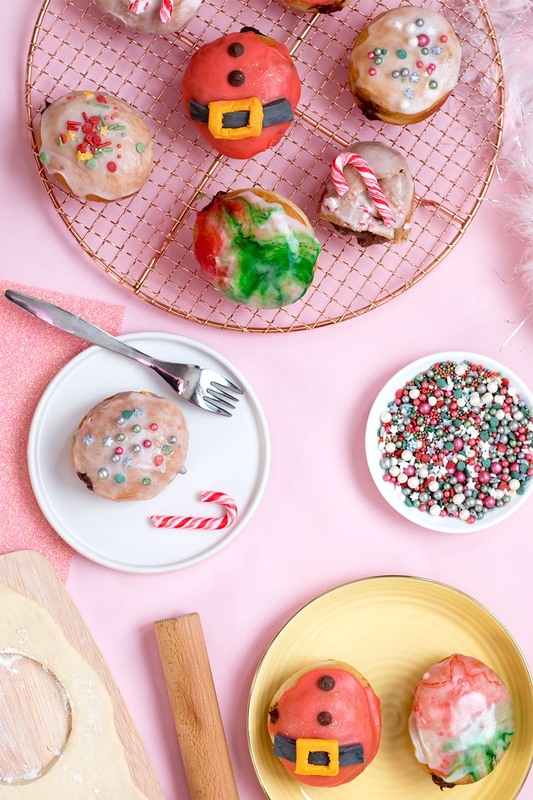 I really wanted to challenge myself when it came to baking this blogmas. I have been working really hard with my recipes this year, and I feel like I've mastered (in my own way of course) the traditional cupcakes and traybakes. The only way you can improve and learn is to push yourself, but luckily for me, pushing yourself when it comes to baking leads to very tasty results. 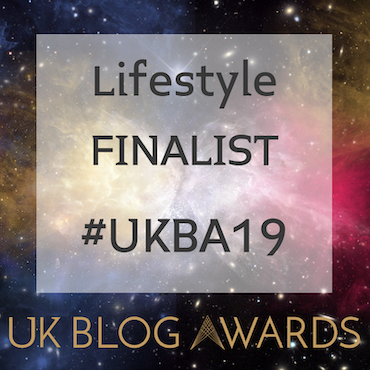 Over the next few weeks, you're going to be, hopefully, inspired by some brand new recipes I'll be showcasing right here including a cheesecake, churros, mini tartlets, and a very special loaf cake. 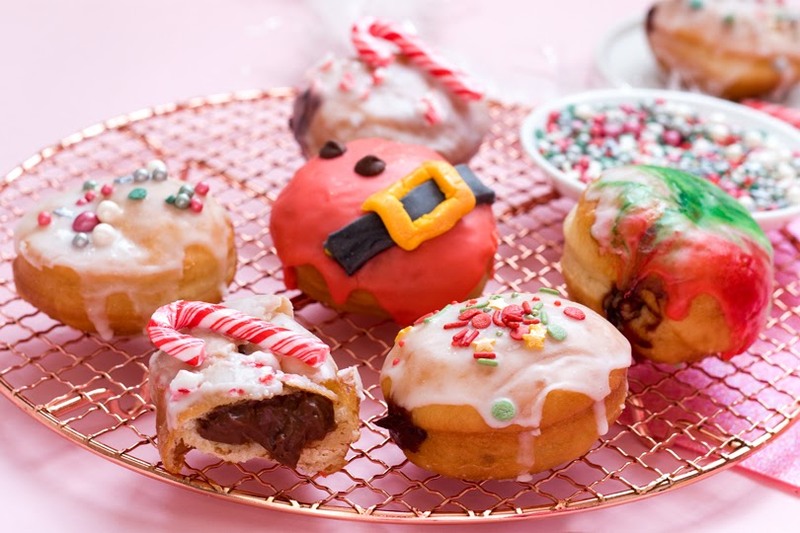 But enough about future posts, let's talk about these festive doughnuts. Doughnuts are not as simple as they used to be. I do love freshly made doughnuts which you can get at the seaside that are covered in powdered sugar; so warm and light. Nowadays, highly decorated doughnuts are everywhere, and I'm definitely not complaining about that because I am quite a fan. I guess you could say this is a homage to those delicious delights. I've got to admit that dough used to scare me, especially dough that needs to be left to rise. It's the fear of leaving something for a significant amount of time and not knowing what it's going to look like once you've returned. I can happily announce that dough is no longer a worry of mine. Making the dough is very simple, it does take a little more time having to prove the dough twice, but please don't rush this or you won't get these light and soft doughnuts. I have included a rough time in the method below, but it all depends on your location and how warm the place is where you'll store your dough. All you are looking for is a dough that has doubled in size. Have I mentioned that these doughnuts are in fact filled with the creamiest of custards? A chocolate orange custard to be exact as there is nothing better than chocolate orange during the Christmas period. I was weighing up a few ideas on what to use as a filling, one of which was a ganache, but I thought it would be too sweet with the added icing sugar on top of that; I think I'm learning that not everyone has a strong sweet tooth like mine. 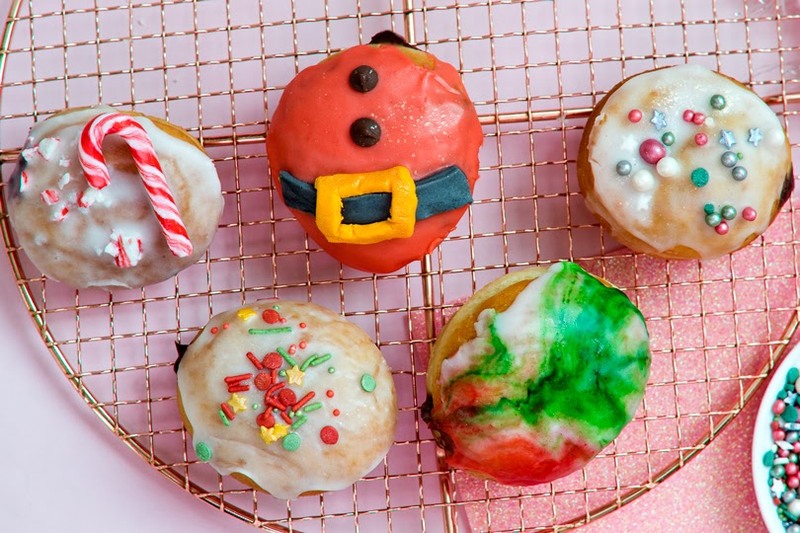 Decorating your doughnuts are of course optional, but these do look super adorable! 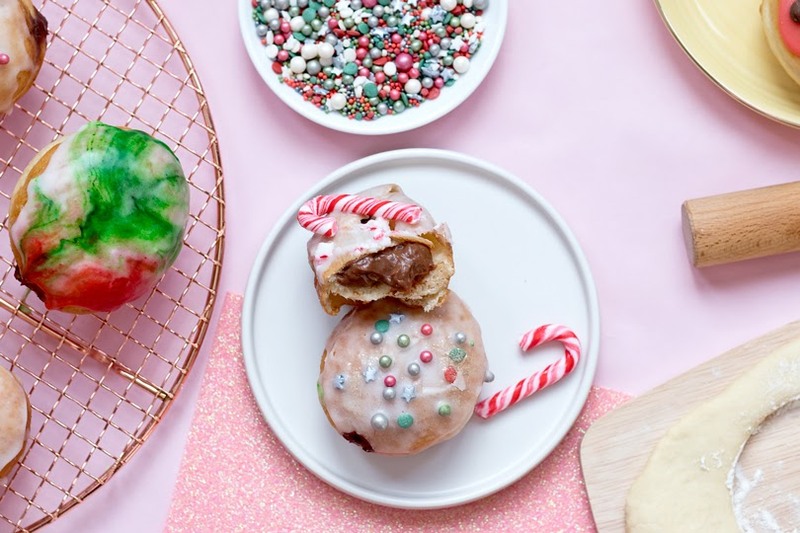 I thought I would try a few different styles; Santa's belly decorated with rolled icing details, a 'Christmas galaxy' with a blend of festive colours, crushed candy canes, and decorated very simply with some very festive sprinkles. These sprinkles were sent to me by Baking Time Club*, and they honestly have the most beautiful and adventurous sprinkles out there - all completely vegan! You know how much I love my sprinkles and glittery additions, so you'll be seeing these in many bakes coming up. I'd always thought it would be so hard to make doughnuts that taste exactly like doughnuts - but these do. They have a soft light texture, plus a centre filled with the creamiest chocolate orange custard, and a little added sweetness on top. They taste best fresh, which probably won't be an issue as one definitely won't be enough. These would also be a great addition at a Christmas party, or even ready for Christmas day. They would get a lot of heads turning, and mouths watering! Warm the dairy-free milk in the microwave for 1 minute. Stir in 1tsp of the granulated sugar and sprinkle over the sachet of yeast. Leave to froth for about 15 minutes. Mix together the ground flax seed with the water and leave to thicken. In a large bowl sift in the plain flour, baking powder, remaining sugar, and salt and mix together. Pour in the melted butter, milk mixture, and flax egg. Bring together to create your dough. Tip your dough onto a floured surface and knead for 5-10 minutes until the dough is smooth and springy - check by pressing your finger into the dough which should spring back. Put the dough in an oiled bowl and leave covered for about an hour or until it has doubled in size. Tip your dough onto a floured surface again and knead for a few minutes to remove any air. Roll your dough out to about 1 1/2cm thick, and use a 3" cutter to cut out your doughnuts and place onto a floured tray. Re-rolling the dough can make tough doughnuts, so roll the extras to doughnut balls. Cover and leave to double in size for another hour. Heat the oil in a deep pan until it reaches 190°C/375°F. Slowly and carefully place the doughnuts into the oil, a couple at a time. Fry for 1 minute each side or until golden brown. The doughnut should sound hollow when tapped. Leave on kitchen paper and continue with the rest of the doughnuts. Custard While the doughnuts are cooling, mix about half of the milk with the cornflour until it has completely dissolved. In a saucepan, add the rest of the milk, granulated sugar, vanilla, zest and fresh orange juice and warm. Add the cornstarch and milk mixture and keep whisking. Add the chocolate. Whisk until it's smooth and leave to cool down. Use an injector or a piping bag with a tube or round tip nozzle. Carefully fill each doughnut. Icing Mix a little milk with the icing sugar until you get a thick but pourable consistency. Add food colouring gel if you would like to change the colour. 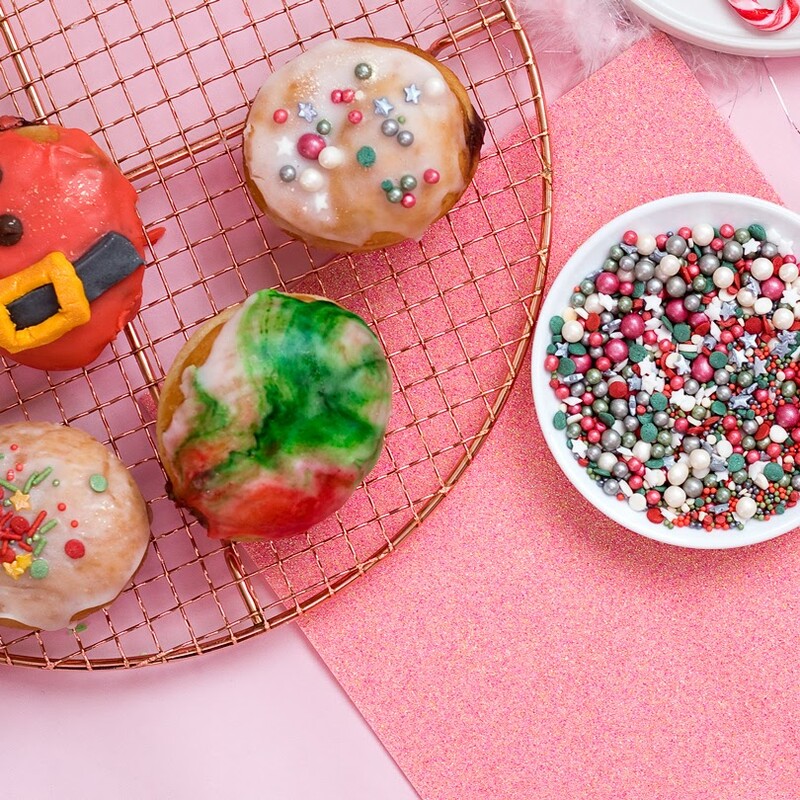 Dip your doughnuts and decorate. These are best eaten fresh. I will definitely be making some more doughnut recipes next year. Let me know in the comments below how you prefer your doughnuts; filled or the original covered in powdered sugar. This is the first of many blogmas bakes, check out my advent calendar to see what's to come. 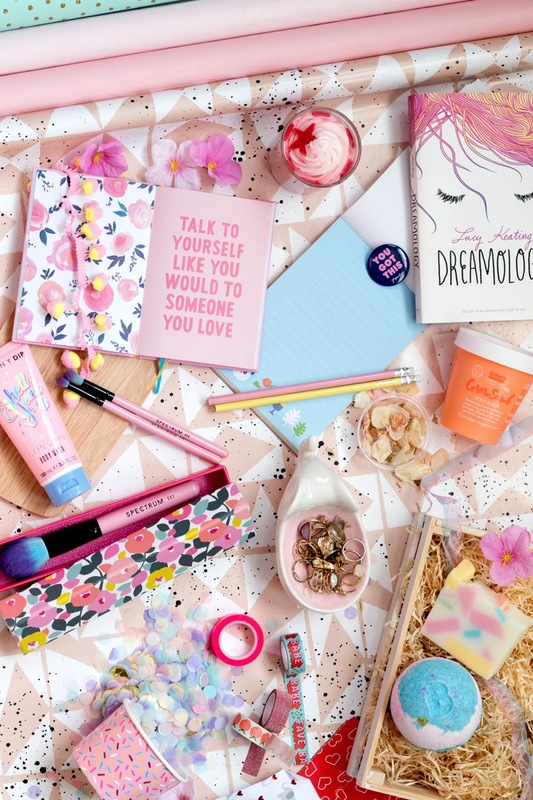 *This post contains items send from Baking Time Club, but all opinions are 100% truthful and honest. You can read my full disclaimer policy here.